﻿﻿ My wife and I have lived through 3 daughters who got their drivers licenses right here in Dartmouth. So, we know first hand the trials, tribulations and anxiety that parents go through when trying to teach their kids how to drive. And, much of the stress that we experienced when teaching our girls how to drive came from other drivers on the road. Drivers who didn’t know our daughters were student drivers would tend to be impatient and really tended to tailgate. And when that happened we could literally see our daughters tense up as a line of cars formed up right on their tails. We want to thank the students and faculty of the Dartmouth High School Media Department in the development of this video. So when my step daughter who most recently got her license was practicing, I came up with an idea to try and help the situation. Like most of us, I turned to the internet and found these great Student Driver Magnets and I bought a few to put right on the back of her car when she was out practicing. It immediately tended to back other drivers off and made learning much easier for her. So as a Dartmouth resident and business owner, we decided to pay it forward and help other Dartmouth families with student drivers. 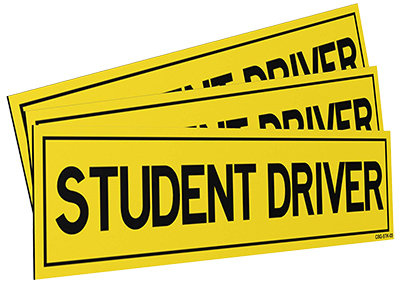 And right now we’re offering these free Student Driver magnets to any Dartmouth family with a student driver in the household. The only thing that we ask is that when you’re done with it then you pay it forward and give it to another Dartmouth family with a student driver.